A group of 70 or so "books", each with between five and 15 lead leaves bound by lead rings, was apparently discovered in a remote arid valley in northern Jordan somewhere between 2005 and 2007. A flash flood had exposed two niches inside the cave, one of them marked with a menorah or candlestick, the ancient Jewish religious symbol. A Jordanian Bedouin opened these plugs, and what he found inside might constitute extremely rare relics of early Christianity. That is certainly the view of the Jordanian government, which claims they were smuggled into Israel by another Bedouin. The Israeli Bedouin who currently holds the books has denied smuggling them out of Jordan, and claims they have been in his family for 100 years. Jordan says it will "exert all efforts at every level" to get the relics repatriated. The director of the Jordan's Department of Antiquities, Ziad al-Saad, says the books might have been made by followers of Jesus in the few decades immediately following his crucifixion. "They will really match, and perhaps be more significant than, the Dead Sea Scrolls," says Mr Saad. "Maybe it will lead to further interpretation and authenticity checks of the material, but the initial information is very encouraging, and it seems that we are looking at a very important and significant discovery, maybe the most important discovery in the history of archaeology." They seem almost incredible claims - so what is the evidence? 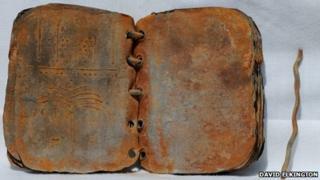 The books, or "codices", were apparently cast in lead, before being bound by lead rings. Their leaves - which are mostly about the size of a credit card - contain text in Ancient Hebrew, most of which is in code. If the relics are of early Christian origin rather than Jewish, then they are of huge significance. One of the few people to see the collection is David Elkington, a scholar of ancient religious archaeology who is heading a British team trying to get the lead books safely into a Jordanian museum. He says they could be "the major discovery of Christian history", adding: "It's a breathtaking thought that we have held these objects that might have been held by the early saints of the Church." He believes the most telling evidence for an early Christian origin lies in the images decorating the covers of the books and some of the pages of those which have so far been opened. Mr Elkington says the relics feature signs that early Christians would have interpreted as indicating Jesus, shown side-by-side with others they would have regarded as representing the presence of God. "It's talking about the coming of the messiah," he says. "In the upper square [of one of the book covers] we have the seven-branch menorah, which Jews were utterly forbidden to represent because it resided in the holiest place in the Temple in the presence of God. "So we have the coming of the messiah to approach the holy of holies, in other words to get legitimacy from God." Philip Davies, Emeritus Professor of Old Testament Studies at Sheffield University, says the most powerful evidence for a Christian origin lies in plates cast into a picture map of the holy city of Jerusalem. "As soon as I saw that, I was dumbstruck. That struck me as so obviously a Christian image," he says. "There is a cross in the foreground, and behind it is what has to be the tomb [of Jesus], a small building with an opening, and behind that the walls of the city. There are walls depicted on other pages of these books too and they almost certainly refer to Jerusalem." It is the cross that is the most telling feature, in the shape of a capital T, as the crosses used by Romans for crucifixion were. "It is a Christian crucifixion taking place outside the city walls," says Mr Davies. Margaret Barker, an authority on New Testament history, points to the location of the reported discovery as evidence of Christian, rather than purely Jewish, origin. "We do know that on two occasions groups of refugees from the troubles in Jerusalem fled east, they crossed the Jordan near Jericho and then they fled east to very approximately where these books were said to have been found," she says. "[Another] one of the things that is most likely pointing towards a Christian provenance, is that these are not scrolls but books. The Christians were particularly associated with writing in a book form rather than scroll form, and sealed books in particular as part of the secret tradition of early Christianity." The Book of Revelation refers to such sealed texts. Another potential link with the Bible is contained in one of the few fragments of text from the collection to have been translated. It appears with the image of the menorah and reads "I shall walk uprightly", a sentence that also appears in the Book of Revelation. While it could be simply a sentiment common in Judaism, it could here be designed to refer to the resurrection. It is by no means certain that all of the artefacts in the collection are from the same period. But tests by metallurgists on the badly corroded lead suggest that the books were not made recently. The archaeology of early Christianity is particularly sparse. Little is known of the movement after Jesus' crucifixion until the letters of Paul several decades later, and they illuminate the westward spread of Christianity outside the Jewish world. Never has there been a discovery of relics on this scale from the early Christian movement, in its homeland and so early in its history.